The Taylor 5925NFS classic tube thermometer is a must have for any refrigerator or freezer, featuring clearly marked color-coded temperature zones that let you see instantly whether foods are being stored at safe temperatures. This thermometer also boasts a shatterproof plastic construction and non-toxic liquid that will keep your food in safe conditions. Built in hooks and provided suction cups allow hanging at your convenience. We bought these for our freezers. They work great. We have ordered different thermometers and our managers requested these every time. I would recommend these. As described. Quickly reached the temperature only after minutes of being inside the unit. It also reads very closely to the electric temperature. Would purchase again. Good quality fridge and freezer tube thermometer which mounts easily to the wall with two suction cups. The thermometer has easy to read numbers and labeled ranges for fridge and freezer. Does the trick to measure temperature that does not thoroughly need to be measured. If you need a general measurement you are good but more thoroughly opt for something digital. This thermometer reads the temperature well but it has a hard time staying connected to the suction cups. I've moved it around quite a bit now but I can't seem to find the right spot for it. It keeps falling off. This thermometer has been accurate in displaying the correct temperatures in both the fridge and freezer. The glass doesn't fog up and the numbers are clear to read. These thermometers are very cheap and they are not very accurate. I had two right next to each other giving me different temps and the suction cups do not work well at all. I recommend spending a little more. Works great and gives us an accurate temperature reading! Sometimes we use suctions to stick these up on the fridge or freezer walls, but they also rest nicely on the shelf. These Taylor 5925N Thermometers are in each of our fridges and freezers. They suction up for easy visibility so you can check temperatures without even opening the glass door. We have one of these in every one of our freezers/ refrigerators. they stick well, are acurate and are easy to read. they even work well in portable coolers. Great product , easy to read i bought a bunch of them , easy to attach i will definitely buy more of them and the price is unbeatable . In general this is a nice thermometer. it is reasonably priced, sturdy, and easy to read. The issue, and it is a big one, is that the suction cups don't work very well. besides that, it's very good, however. Easy to read, has 2 suction cups so you can stick this in anywhere you like in the fridge. A good thermometer for any kitchen. The Taylor Classic Refrigerator/ Freezer Tube Thermometer is an easy to read thermometer that is accurate in temperature readings. It can be placed on a wall by the suction cups or hung. I purchase this just to be sure my refrigerator was staying cold enough. I like the larger face on this thermometer that is easy to read. Good thermometer, pretty accurate. I like that you can either use the suction cups or the metal clips. The numbers are very easy to read. it is so good refrigerator and freezer thermometer, perfect size, up and down adjustment make it easy to view. we believe this brand, and we recommend it. This is a dual purpose thermometer for both refrigerator and freezer! And comes with a convenient suction cups for mounting! Also, very easy to read. 5 stars! Fits in perfectly with the walk in here. Easy to read, the staff has no questions when it comes to updating the temperature logs, anymore. This product is perfect for every refrigerator or freezer in your business. Also required in most states by the health department. Great low price and accurate temp. We needed multiple thermometors for our fridges and freezers. I really liked the color coding option. Although the suction cups are a little small and we had some issues getting them to stick long term. So we switched to a color coded dial version that works much better for us. Perfect little thermometer. This keeps the heath dept happy, and it honestly is very easy to read and we have one in every fridge in every location. This is a pretty good cheap thermometer. The suction cups don't work very well, but you can attach it to the shelf via the arms. These are great, very easy to read and the color coding makes them perfect for fridge or freezer and even in our ice cream machine. Great value priced as well. I definitely will be purchasing more of these for everything refrigerated in my kitchen. Nice quality and they it's so nice that they are easy to read at a quick glance. Great price for a little affordable thing but the suction cups probably won't last longer than 2 weeks so I don't have high hopes for these. These thermometers come in handy when transporting items in coolers, and we also use them in our freezers and walk-in cooler. I trust the Taylor brand for accurate results. Great thermometer. Really easy to read, and it easily fits on to what size wire shelving you have. It is really accurate and is very inexpensive. These thermometers are very durable and easy to read. The health inspector was very pleased that we had these thermometers in all of our coolers and freezers! I love how easy this has made reading and placing thermometers throughout our various refrigeration units. The suction cups aren't super strong so they do fall off occasionally but are easy to put back on. For the price, I was able to buy multiple thermometers for my refrigerator and freezers. Easy to hang with either the clips or suction cups. They seam to be accurate and are easy to read. Exceptional Value for a thermometer! This thermometer is large enough to read clearly and is very accurate. We use this in our refrigerator at work. I would highly recommend it. Hooks easily and securely in place to a shelf or wall, out of the way so as to not be knocked off and broken. And gives clearly readable and accurate temperature measurements. This is a nice thermometer at an affordable price. Make sure the area you are sticking it too is free from moisture so the suction cups will hold. We purchased these thermometers to ensure our fridge and freezer were keeping food at the correct temperature, as we had been seeing some spoilage. The thermometer showed that they were running warm, so we were able to get service technicians out for repairs. I'd say this qualifies as functional. The downside is that getting the thermometer to stick on the inside wall is almost impossible, at least in a way that leaves the temperature legible. In order to push on the suction cups you have to push on the thermometer, which bends the metal arms. The metal arms would need to be angled up, as otherwise the thermometer leans downward and is difficult to read. The bending of the metal arms means they don't maintain the necessary angle. We have worked around this by leaving them on shelves, using the metal arms and suction cups as support. Nice buy, we use these as secondary thermometers in all of our pieces of equipment. The bottom bar is a great reminder of the temp ranges for forgetful employees. These thermometers are stationed in our refrigeration systems that are throughout the restaurant. The small nature of the thermometers allows us to conserve space, but also allows ease of recording the temps every night, as is part of the regulations. Would recommend this item. Perfect thermometer for refrigerators and freezers. I will put these in all my fridges, nice and small and out of the way yet easy to read, big display of temp. this is your basic thermometer. I use it in a storage freezer and when doing sales with my mobile cooler, to keep track of my temps! Having had a lot of issues with my freezer, I'm never too sure if it's in the operational temperature. Now my problems are solved with this thermometer. It's got two little suction cups to stick to the freezer wall or door in my case. I have had no issues with the accuracy and it's a relief to know that my freezer is well in temperature. These are big and easy to read. I'm sure health inspectors will be happy to see one of these in each and every fridge/freezer. I bought 6 to get the quantity discount and just to have extra on hand for replacement in the future. 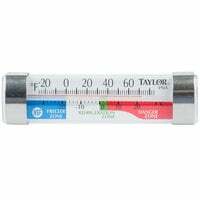 Taylor 5925N Classic Refrigerator / Freezer Tube Thermometer is a reliable thermometer. I had to buy a few because the food inspector required to have one in all refrigerators. Only problem is that they keep falling off the interior of the fridge. I really liked these refrigerator / freezer thermometer's, an economical way to check your cooler temps and keep food from spoiling. Easy to read and has the safety zone for food temps. A requirement by food inspectors this thermometer makes viewing the temp of your fridge/cooler real easy and will leave no doubt in your mind if your products are at the proper temp. It is a basic thermometer and does its job, though the suction cup on the back doesn't stick too easily, but you can still use the metal clips to attach it to a shelf. The Taylor Classic Refrigerator and Freezer Tube Thermometer is super reliable and the price is very affordable. The low price allows us to buy many and place them all over all of our fridges. The Taylor 5925N is a nice easy to read thermometer, Looks great and works great. Comes with 2 suction cups to install it or clips to hang. A great inexpensive constant way to know your refrigeration equipment is keeping temp. It is easy to read, works great and doesnt break the bank! This is a great little thermometer to assure that your refrigerated area is at the proper temperature. The suction cups do not like to adhere for any length of time, but is still a handy item to have and easy to read at a glance. Snap or clip on is easy to put it any where and easy to read the display.No faulty reading yet after years of using it.Reliable product for the money. Public Health just inspected our new commercial kitchen and they were pleased to see this easy to find and easy to read thermometer in our freezer.